Burlesque is an art-form known for mixing raunchy with class. Ashley Luke Lloyd has brought the classy side of burlesque to the foreground in his new musical ‘Burlesque’d’. 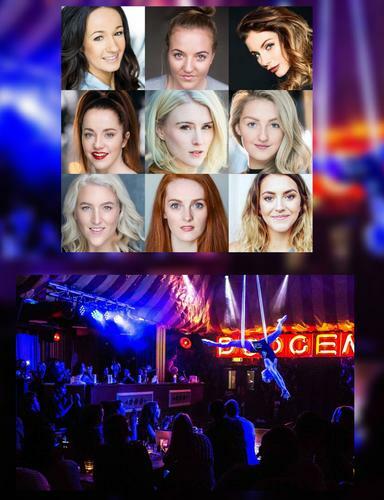 Staged in the wonderful surroundings of The Aeronaut, this show creates a brand new theatre category just for itself, filling the gap between Cabaret and Musical with huge success. Burlesque’d really is a stage spectacular performed by an incredibly talented cast. Heading up the cast as the small town girl Crystal is the superb Charlotte Jeffery. As Charlotte first walks out to sing, you are simply blown away. Being able to belt out a rock song and follow it with a lovely soft ballad is a talent that you do not see very often. She commands the stage and brings the audience to the centre of the story. Her duet ‘The Show must go on’ with the fantastic Brooke Havana Bailey as Isabella was breathtaking, generating cheers from the audience well before the end of the song. All of the well known songs performed in the show (Emily Shuck as Chess completing the trio of singers) were sung fantastically with incredible vocals. One of the most fantastic sections of this show was the fabulous use of Aerial Acrobatics which were performed exquisitely by Valentina Canadiani and James Paton. The amazing stunts performed with such skill and precision created a different feel to the show and gave it the ‘WOW’ factor. The pair also played characters in the show, creating the roles of Sofia and Emcee with huge flair and presence. In a show such as this, it is impossible to miss out the Showgirls. Entertaining the audience in this very immersive production with flawless choreography and the attitude you would expect from Burlesque. Audiences will simply be blown away by the skill and energy of the fabulous Showgirls. Burlesque’d is a show that will make you beg for more and with an incredible cast it seriously is a night that you will never forget.